Characteristics : Its body is long and thin, and its tail is a little longer than the body. Its back is brown and it has lots of spots on its both sides. The body is smooth and has a gloss. Its trunk is about 4~5cm in length and the whole body is around 10cm. Ecology : It lives in dark and wet areas, mainly appears at night, but during the daytime it conceals itself under a log or leaves. In spring and fall, you can find it taking a sunbath. Their feed is small insects which live on ground. It lays 1~5 eggs in late June. Where you can see this species at Dongbaekdongsan : It can be seen in the forest or around rocks at ponds. At sunset, it is more easily seen around Meonmulkkak marsh than other places. Characteristics : Its mouth is sharp and its color is olive. It got its name because it has a clear white line on its body, from end of the head to its trunk. Its tail is much longer than its trunk, and it has one hole on each thigh. Ecology : It usually comes out of hibernation, starting from April, and call into activity. On about May the mating season begins ,and they start to lay eggs from June to July and August. It discovers generally a sunbath at a sunny place in the daytime and tends to hide in a thicket or a den where they can hide their body as people or predator appear before them. In the second ten days of october, Most of individuals find a den of the ground and begin hibernation. It lays in a thicket of meadow, the ground or a crack of stone and has a habit buried for soil under 1cm. It usually lays about 4~5 spawns and the color is white. It mainly eats small ground insects like spiders and crickets. Where you can see this species at Dongbaekdongsan : You can’t see it in the forest but in bushes, at grasslands, and on small trees. Characteristics : Its body length is usually about 40~60cm. The trunk is thicker than other snakes of same size. Its body color is mainly red and orange or dark brown. Its head is a triangle shape and there is a thin white line on the upper part of eyes. Color of a lingua is red and end of its tale is red or similar to its body color. On its body, it has a stripe or disk shape and strong mastodon bones. Ecology : Mostly they are found in many places such as farmland, marsh, low mountain and forest. In spring and autumn, we can observe them during daytime mostly, but in summer, they are active at night. They usually mate between July and September. They store eggs in salpinx without fertilization, then they produce babies(not eggs) in August and September after a pregnancy period about 60 days in the following year after the copulation. And they usually eat frogs, centipedes, lizards, other snakes, rodents and so on. Where you can see this species : They can be found in pond, wet land, woods and other places, especially around Meonmulkkak. When tree frogs lay eggs, we can find them ambushing for preying on tree frogs. Characteristics : Its back is reddish brown or dark grayish brown, and the color is light at the rear. 5 lines of scales on its head and center of its back are dark brown. It has mastodon bones on its body and black spots at the end of each scale on its belly. 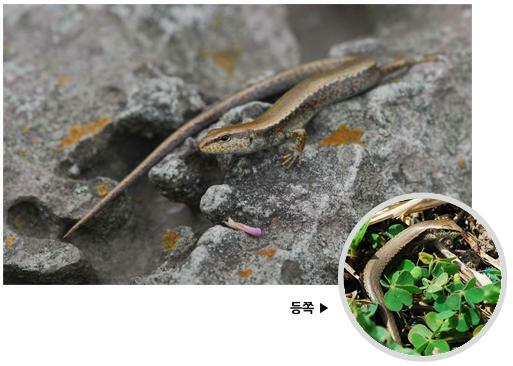 This species in Korea is very small, about 40 to 70cm and usually around 50cm in length. It is not a poisonous snake, and is mild in temper. Ecology : This snake is active in the evening or when it isn’t sunny or clear. It swims well but it is more easily affected by dryness and cold than other reptiles in the same place are. It lays 2 to 10 eggs or so in July and August, and goes into hibernation. From May of the following year, it becomes active again. It usually lives on small frogs or worms. Where you can see this species at Dongbaekdongsan : It is observed at a pond, around the swampy land and the forest.